A significant but largely inaccessible survey of more than 130,000 women religious in the late 1960s is now available to scholars around the world, thanks to a digital preservation effort by the University of Notre Dame Archives and Hesburgh Libraries. 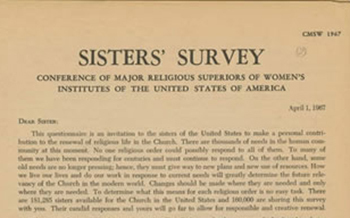 University archivists, librarians, subject experts and digital preservation specialists collaborated to migrate The Conference of Major Superiors of Women (CMSW) Sisters’ Survey of 1967 to a digital format that researchers can access online. Known as the “Sisters’ Survey,” the dataset was originally generated and maintained on computer tapes as part of a multi-part study conducted by Sister Marie Augusta Neal, a member of the Sisters of Notre Dame de Namur (1921-2004). The data, along with the findings and related records compiled by Sister Neal during her decades of research, came to the University of Notre Dame Archives in 1995 and 1996 as part of the Sister Neal Papers. While Sister Neal served as director of the Research Committee for the CMSW (later renamed The Leadership Conference of Women Religious), she began a study of the lives and attitudes of women religious in light of the changes brought about by the Second Vatican Council. In 1967, she directed a survey of all members of congregations of women religious. It included 649 questions that were sent to nearly 400 congregations and over 130,000 individual sisters. The Sisters’ Survey holds the coded responses to this survey. The University Archives has served as the steward of Notre Dame’s history since its founding in 1842. To date, the University Archives encompasses over 45,000 linear feet of archival records, manuscript collections, photographs, audio-visual materials, artifacts and 281 terabytes of born-digital and digitized materials. Through its rich historical resources, the Archives represents “the institutional memory” of the University and also provides the larger research community with a broad historical focus on the evolution of Notre Dame, its place in higher education, and its place in American history. In addition, the University Archives houses one of the largest and most comprehensive collections on the history of American Catholicism in the country. As with most industries and areas of specialty, the digital landscape has demanded that archivists adapt and change. This changing landscape recently prompted the reorganization of the University Archives into the Hesburgh Libraries’ organizational structure. This realignment has invigorated both programs and expanded the University’s ability to leverage expertise and steward resources across traditional and emerging areas of scholarship. Preservation, discovery and access to growing multi-format collections require that archivists, librarians, scholars and information management experts work in collaboration and across disciplines. The Sisters’ Survey project is an example of the impact that results from these internal and external partnerships. When Lamb approached Helen Hockx-Yu, program manager for digital product access and dissemination, about the Sisters’ Survey dataset in the University Archives, he knew it had significant research value. It was the Archives and Libraries’ combined expertise, along with the contributions of others that ultimately brought this important dataset to the world. 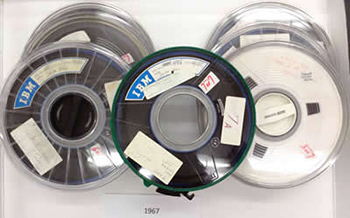 “The dataset was previously migrated forward to survive media deterioration on two occasions, from tapes to CDs, then to computer hard drives," said Hockx-Yu. “We needed to take additional steps to preserve and provide access. With the help of James Ng, economics and social science data librarian, we were able to clean and reformat the data, migrate it to newer file formats, decode the dataset, and place it into context by cross-referencing the sisters’ responses with the corresponding survey questions." Jean McManus, librarian for Catholic studies, and Kathleen Cummings, director of the Cushwa Center for the Study of American Catholicism and coordinator of the Conference on the History of Women Religious, helped to further contextualize the data within the larger scope of Catholic history. From there, Notre Dame Archives facilitated proper permissions and rights management to ensure access to the born-digital materials. 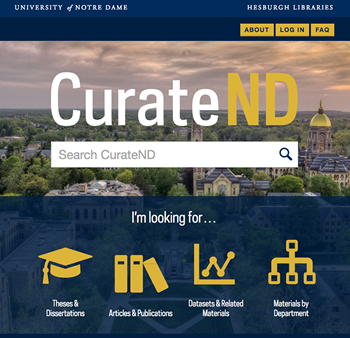 The dataset and related works now have a new home at CurateND, Notre Dame’s institutional repository. “This project is a perfect illustration of what digital preservation entails and what is required of us to proactively manage and ensure ongoing access to digital collections,” added Hockx-Yu. Digital content has altered the work of archives and libraries and the ways in which they manage their collections — and most preserve and provide access to more resources than ever before. Preserving digital content is multifaceted and complex. It requires collaborative efforts over time and across specializations in order to succeed and have institutional impact. Facilitating the sustainable preservation and discovery of print, analog and born-digital materials can only be realized through innovative approaches, teamwork and cross-campus partnerships. Originally published by Tara O’Leary at news.nd.edu on October 06, 2017.